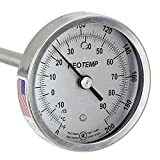 A compost thermometer is a necessary piece of equipment for hot composting. The higher the heat, the faster your materials will break down. But you don’t want it too hot, lest your pile dry out! So today, we’ll take the mystery out of the humble backyard thermometer. These devices are fairly simple to use, but they’re definitely necessary. And it’s important to get the right one! Hot composting takes a little bit of practice, but the basics are easy enough to grasp. Using a mix of brown or carbon-rich material and green or nitrogen-rich material, you make a pile. Layer brown things like dry leaves or wood chips with green stuff like the contents of your kitchen compost bin. Moisten the pile with a hose. You can also fill a sturdy compost tumbler with similar layers of these materials. Keep the contents moist, but not wet, and let nature do its work. As microbial action begins in the pile, it will begin to heat up. In its ideal form, you will keep it at 140 degrees for at least three days before it begins to cool down. In reality, the range can be anywhere between 120-160 degrees. When it starts to cool down, it’s time to turn your compost. Tumblers are easy to turn – just slowly spin the container. For piles, you’ll want to remove the outside surfaces of the pile to create the center of your new pile. This ensures you get evenly-composted material. But when do you turn your pile? Usually, once it’s dropped out of the active “hot” phase, or when it drops below 110 degrees. As you can see, having a thermometer in place really helps you to know if you’re getting the right heat level. It also helps you decide when it’s time to aerate and turn your pile again. Thankfully, the makers of compost thermometers have made it very easy to read most types. Not only are the temperatures shown, but on most models a range is indicated. This helps you to gauge at a glance if you’re in “hot”, “warm”, or “cool” composting temperatures. The compost temperature probe can vary in length, enabling you to use it on deeper or smaller piles. It should be placed in the center of your pile. You can actually leave it there if you’d like! People using tumblers should insert them at least 10-15 minutes prior to reading it. This gives the thermometer time to adjust to the compost heat. There are a couple of digital thermometers available which can give you a fast reading. These tend to be very pricey, and you’ll have a similar result with a traditional model. I’m not going to lie, this is an expensive thermometer. It costs more than five times the amount of most other models. But if you want a thermometer that will last for the rest of your life, you want this one. 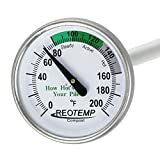 REOTEMP thermometers are by and large the industry standard. This one goes above and beyond the others to give you a durable and accurate measurement. Available in lengths ranging from 24″ to 60″, this composting thermometer has a 5/16″ diameter stem. That’s much thicker than other models. The 3″ wide dial is hermetically sealed, which ensures it’ll never fog up and be hard to read. If you’re trying to get a professional-model compost thermometer, this is what you want. It’s sturdy, accurate, and definitely worth the money. Are you a newbie to composting? If so, you probably don’t need this expensive of a tool yet. If you decide you’re a composting fan after some experience, then go ahead pick one of these up. You can start with a cheaper model and still get quality compost. Again, REOTEMP is the industry standard. It’s what a lot of other thermometer manufacturers base their composting designs from. And this is a prime example of why they strive to be this good. The basic model has a 1/4″ thick stem and a hermetically-sealed face. It shouldn’t fog up, no matter how wet your pile may be. Designed to be left in place, it’ll hold up for years, possibly forever. I’m not going to claim that it has 100% accuracy. In part, that’s because different areas of your pile may be hotter than others. But it provides a reasonable estimate of what the center of your compost pile is doing at any given time. Three ranges – steady, active, and hot – are shown on the gauge. 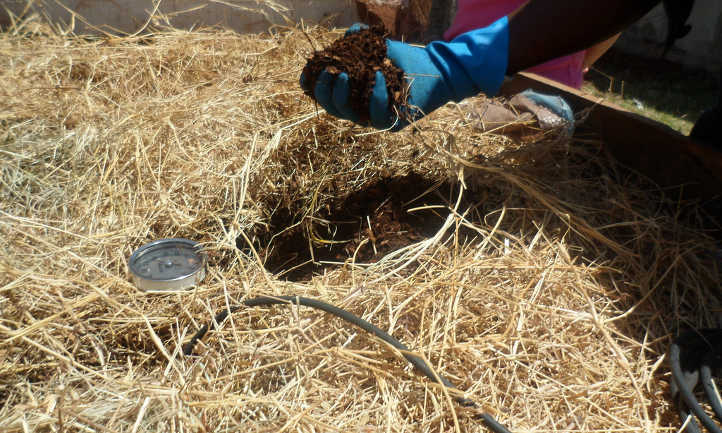 You’ll want to turn your compost when it starts dropping down towards steady, and keep it in the active to hot range. 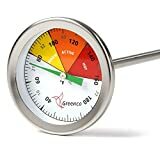 Greenco’s compost gauge shows warm, active, and hot ranges. You’ll likely be turning your pile when it’s at the halfway mark on “active” to keep it going. And that makes it really easy for most new people to read. The downside is that the stem of this model is only 5mm in diameter. It’s very narrow, and may get bent if it sees any rough handling. Don’t force this into the pile — press it in smoothly and fluidly, and stop pushing if you hit something hard. Greenco claims that their gauge is hermetically sealed, like REOTEMP’s are. I’ve seen a few complaints, but usually fogging is limited on this model, which is a perk. If you do experience any problems, this thermometer has a solid warranty. You’ll need to get in contact with the company to sort it out, but prior purchasers have had good luck. 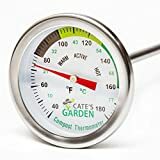 What I like about the Cate’s Garden compost thermometer: its range estimates. Following their ranges, you’re always turning while your pile’s in the “active” range. If it drops out of “hot”, it’s time to turn. I also really like that they chose a 3/16″ diameter stem constructed from stainless steel. It’s rust-resistant and solid. And the dial is also sealed and watertight. But the stem is only 20″ long, and if you’ve got a deep pile, this won’t reach the center. Furthermore, the dial’s only 2″ across, which is smaller than comparable thermometers. It’s still a good option, and will work great for people using a tumbler. For people with a larger pile, this just isn’t quite enough. This would be great for stationary compost bins, though! 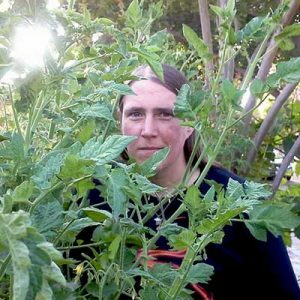 What if you’re a worm farmer? The optimal range for most red wigglers, temperature-wise, is between 60-80 degrees Fahrenheit. When you add food to your worm bin, stuff can heat up. This is especially true if you add nitrogen-dense material like grass clippings. Some other worm food types also get hot. The Squirm Factory compost thermometer is not meant for use in a standard compost pile. Instead, this is meant to go inside your worm bin to give you a good indication of the heat in there. And that can be extremely useful, especially in the dog days of summer. With cute graphics on its dial, it reveals whether your worms are happy with their “weather”. The stem is only 8″ in length, which makes it easy to use with worm composting trays. And, as you only feed in the top couple inches, that’s where your heat will be generated. Like I said, this won’t work for a compost pile or your compost tumbler. But even worm farmers should know the climate of their bins. Remember how I mentioned that digital compost thermometers existed earlier? Personally, I don’t need to go as exact as digital. But if you do, and you’re trying to hit a very specific temperature, there’s an option. 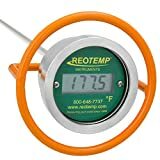 REOTEMP digital compost thermometers are very expensive, but built to last. First off, they have a five-year battery life, which is pretty insane. It’s a bit tough to swap out the battery, but thankfully you won’t have to do it often! Stem lengths range from 24″ to 48″, with price hikes for longer stems. The gauge itself is fully water-resistant, unlikely to fog, and has a cage around its exterior. This protects the glass from possible impact damage. And it’s about as exact as you will get. Its accuracy is within a degree of your true core temperature of where you placed the stem. If high accuracy is your preference, you can’t go wrong with this digital thermometer. But with accuracy comes a pretty significant price hike. This thermometer isn’t for everyone! 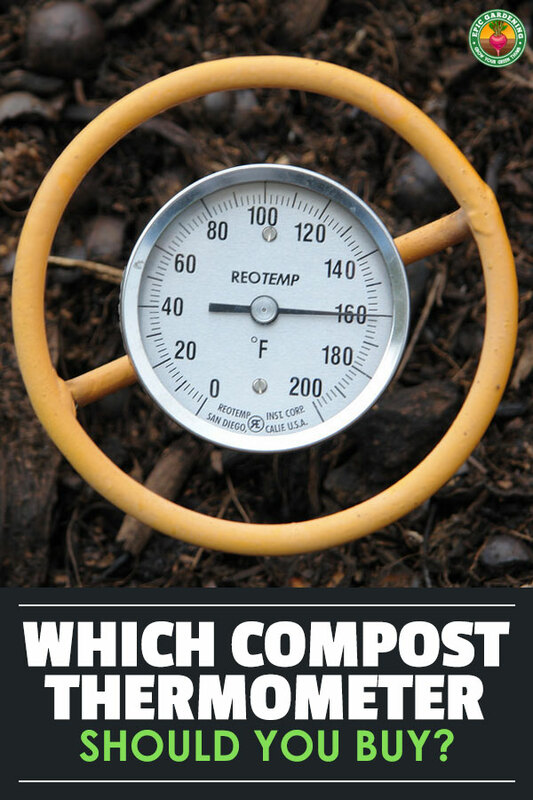 In the end, no matter which compost thermometer you choose, you’re getting a valuable tool. Hot composting kills off weed seeds and sterilizes the material, making it safe for use. But I have to go with the industry standard in this case. REOTEMP’s devices are just too good to pass up, whether you go heavy-duty or standard.